You may remember a few months ago I did a post about our little nephew, Ben. He was diagnosed with leukemia in November. He's been going through chemo. The first round did nothing for the cancer. The second did, and he was in remission. He just underwent his third round to get rid of any cancer so he could be ready for the bone marrow transplant he's in need of. That was to happen the first of next month. Life can change in an instant. Today Ben's in CVICU (cardiovascular intensive care unit) with heart complications. His heart has suffered some damage and needs to be strong enough to continue with his treatment and bone marrow transplant. The next two weeks are critical for him. Doctors say they've never seen a heart as damaged as his recover enough to continue with cancer treatment. Little Ben needs a miracle! He's been such a fighter over these past months, and has made such progress. 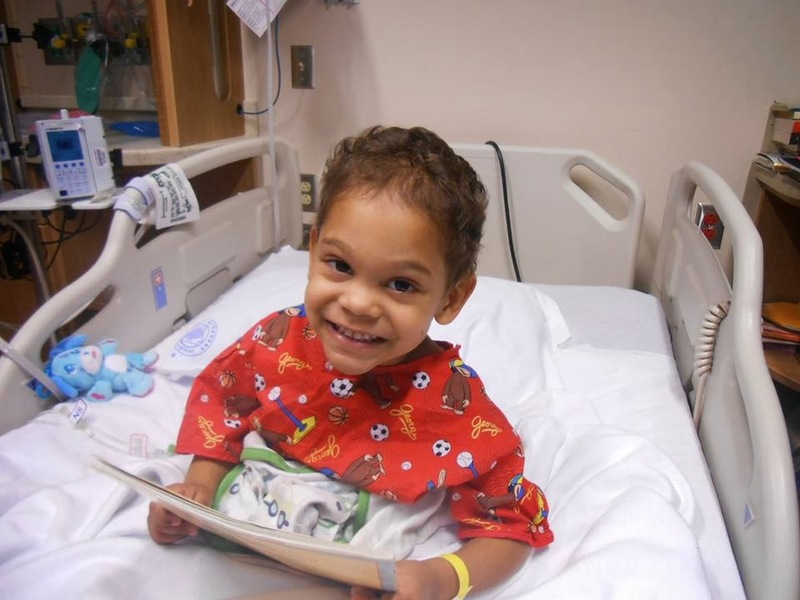 His parents are tremendously strong, and have faith in miracles. As do I! Is he not the cutest thing ever? This picture was taken several weeks ago. He's still adorable as ever, but has a lot less hair now. Any extra prayers in Ben's behalf would be greatly appreciated. His mom apologized on Facebook yesterday for asking, yet again, for more prayers for Ben. I hope she knows that it is an extra special blessing to have such purpose in prayer, and to unite our demonstrated faith in such a worthy cause. 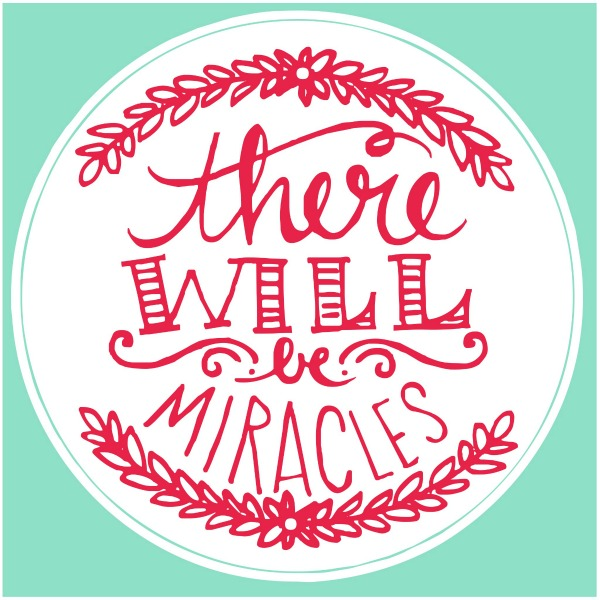 Miracles WILL happen! We love, love, love you, Ben! So, in Ben's honor today I have a miracle printable for you. Thanks to my new favorite app, Rhonna Designs, this printable came together in a matter of minutes. Which is good because my blogging time has been cut short due to the family concerns over the past few days. I always tend to lean towards grays in my printables, but wanted to venture out and use a bit of color today too. So choose which one fits your fancy. Enjoy! Thanks, Emily! It's kind of our family motto for the next little while while Ben's going through all of this. Enjoy your day! Thanks, Mandy! So excited to see your smiling face. Enjoy your weekend! Oh, my heavens. Bless his heart. He is adorable! Keep us updated on how he's doing. I'll include him in my prayers, for sure! Thanks for the prayers, Mariel! He's having a bit of a struggle these past few days. We'll keep praying. Thanks again! What a sweetie. I will pray for him! Love your art piece, I created one very similar and had it printed on a tshirt. Love how Rhonna's app makes it easy to create your own art! Rhonna's done all the work! It's so much fun to play around with, isn't it? Your shirt idea is fantastic! How did you do it? Thanks so much for stopping by! You're so kind and supportive, Cathy! It's so nice to have so many people who don't even know Ben offering prayers and love in his behalf. Thanks so much! need this in my own life! Thanks for sharing. Prayers and thoughts for this strong little boy! I truly believe in miracles! We all need this in our lives, don't we. Sometimes more urgently than others. Thanks for the prayers! I wish you the best with what you're going through. It's never easy, but we do learn and grow in ways we never could without the tough times. Prayers for you as well. Thanks so much for visiting! Come back anytime! As a mom to a baby girl who had open-heart surgery last year, my heart breaks for your family and sweet little Ben. Sending up prayers tonight from CT! There WILL be miracles! !